JayWalk - All Your Xmms Are Belong To Me: Pool Time! The sun was up and it's time to take out the lawn pool and fill it up with water and bubble bath. 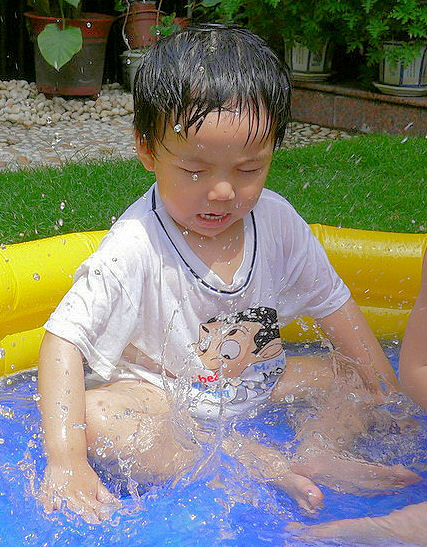 This was Garbriel's second time in the lawn pool. The first time, he was scared of going in. It took quite a while to finally coaxed him in. Once he's in, he doesn't wanna come out! This time round the lawn pool is no longer a stranger to the kids and Faith was jumping in and loading up with toys even before I finish filling up the pool. Click here to view the rest of the set. 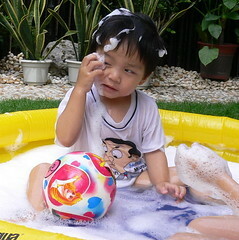 Aloe: But must remember to use the "no tears" formula one or it would sting their eyes jialat jialat. aGentx: It is a good camera and I had it for quite a long time already. Still a very satisfied customer.